For her Hammer Project, Latifa Echakhch will reprise her 2007 work À chaque stencil une revolution (For each stencil a revolution) for the Hammer’s lobby wall. 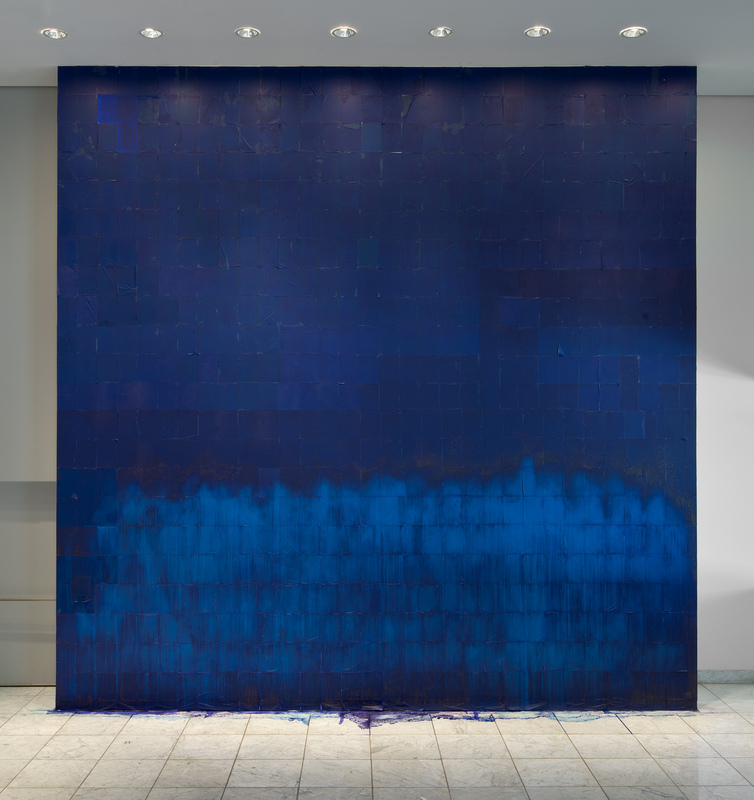 After attaching hundreds of sheets of carbon paper to the wall, Echakhch will treat the surface with a solvent that causes the ink to run down the pages and pool on the floor. Her use of carbon paper points to an outmoded duplication technology that was central to the ability of political groups of earlier generations—such as the civil rights and anti–Vietnam War protests of the 1960s—to disseminate information and opinions. The title of the work is a quotation from the Palestinian leader Yasser Arafat who was referring to the proliferation of revolutionary groups and protest movements. While the work pays homage to the uprisings of that period, it rings with melancholy: stripped of its ink, the paper is robbed of its potential to carry any message. 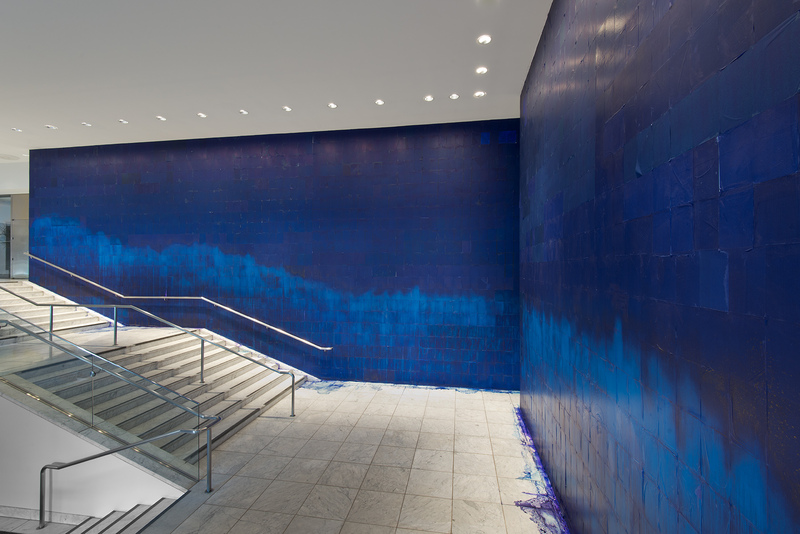 Referring as well to both abstract expressionism and the signature blue of Yves Klein, the work asks us to reconsider the relationship of abstract art to politics. 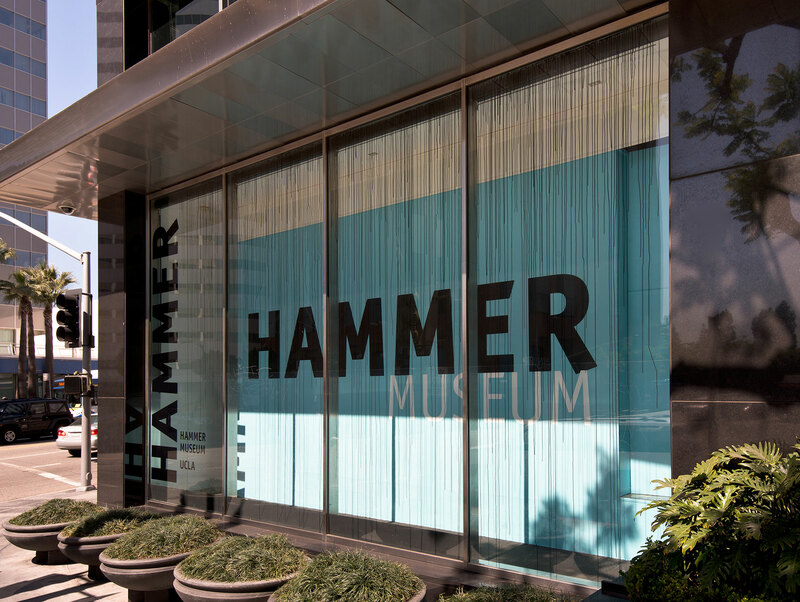 Hammer Projects: Latifa Echakhch is organized by Hammer senior curator Anne Ellegood. Latifa Echakhch was born in El Khnansa, Morocco in 1974 and lives in Martigny, Switzerland. Eponymous exhibitions of her work have been presented at Portikus, Frankfurt am Main, Germany and Kunsthaus, Zurich, Switerland (2012); Museum Haus Esters, Kunstmuseen, Krefeld, Germany (2011); MACBA, Barcelona, Spain (2010); and Tate Mondern, London, England (2008). Her work has been featured in thematic exhibitions internationally, such as It is what it is. Or is it?, Contemporary Arts Museum, Houston (2012); ILLUMInations, Venice Biennale, Venice, Italy (2011); 21st Century: Art in the First Decade, Queensland Art Gallery, Gallery of Modern Art, Brisbane, Australia (2010); Flow, Studio Museum Harlem, New York (2008); and Global Feminisms, Brooklyn Museum, New York and Davis Museum and Cultural Center, Wellesley, Massachusetts (2007). While the specific technologies have changed, activists have always used whatever mechanisms were available to spread information and advance their causes. In the 1960s the mimeograph, or stencil duplicator, was considered such a powerful tool that the Palestinian leader Yasir Arafat acknowledged its enormous influence when he stated, “For each stencil a revolution,” recognizing that the ability to disseminate statements and opinions through such technologies was indispensible to the protest movements proliferating around the world at the time. The Moroccan-born artist Latifa Echakhch borrowed Arafat’s comment for the title of her work À chaque stencil une revolution (For each stencil a revolution, 2007–13), in which a nearly obsolete material for creating duplicates, carbon paper, is the primary material. Directly adhering hundreds of sheets of the dark paper to the wall like wallpaper, she then sprays methylated spirits across the surface, creating a mottled effect and causing the ink to run down the pages and pool on the floor. 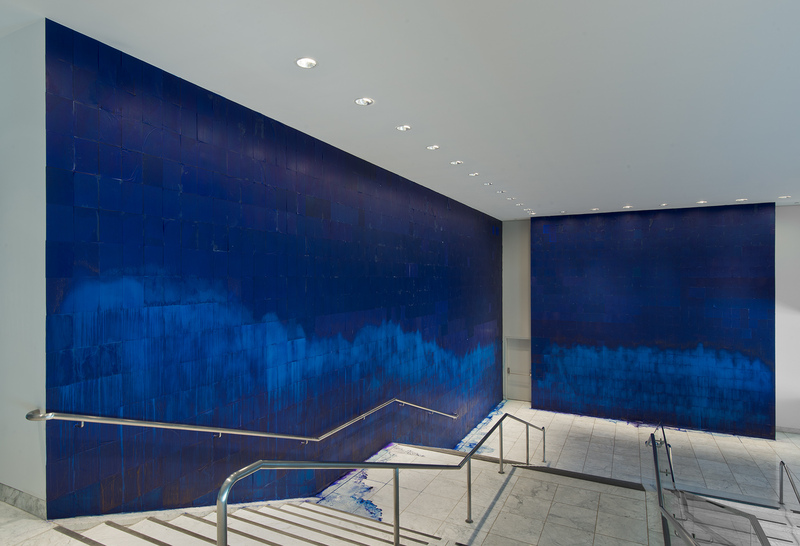 Treated with spirits, the midnight blue carbon paper turns a bright azure reminiscent of Yves Klein’s signature color. Born in Morocco, Echakhch moved to France with her family as a young child. Her experience as an immigrant is similar to those of millions of people around the world. She is an Arab woman who grew up in the West and has no memory of living in her North African homeland. Her relationship to the objects that typify her background—Persian prayer rugs, teacups, tea—are not ingrained or intimate but rather reside at a state of remove. Her work often questions our preconceived notions of nationality and identity. By manipulating found objects or using forms that carry with them the weight of history or a strong symbolic value, she questions our understandings of them and provides a space for what she has called “poetic transfiguration.” (4) In her ongoing series Frames, for example, she removes, strand by strand, the centers of Persian prayer rugs and lays them on the floor. Their decorative patterns are reduced to minimal lines, emphasizing their geometry, and their function of providing a layer of protection between the worshipper and the ground has been exactingly eliminated. For Untitled (Gunpowder) (2008) and Erratum (2004–9), she flung tea and teacups, respectively, in the corners of the gallery. Remarkably aggressive, the works transform objects through acts of premeditated destruction, assertively proclaiming their conversion from useful objects to objects of contemplation. 1. In September 2012 a $1 million settlement was announced, requiring the University of California to pay $30,000 to each of the twenty-one UC Davis students who were doused with pepper spray by campus police. Along with a written apology from the university chancellor to each student, the agreement also requires university officials to work with civil rights advocates to modify crowd control policies and police response tactics. 2. Ramesh Srinivasan, “Taking Power through Technology in the Arab Spring,” Aljazeera, October 26, 2012, http://www.aljazeera.com/indepth/opinion/2012/09/2012919115344299848.html. 3. “HuffPost Arts Interviews Latifa Echakhch on Her Upcoming Exhibition ‘Currents,’” Huffington Post, February 6, 2012, http://www.huffingtonpost.com/2012/02/02/latifa-echakhch-interview_n_1250639.html. 4. See “Interview with Latifa Echakhch,” published in conjunction with her exhibition Speaker’s Corner at the Tate Modern in 2008, www.tate.org.uk/whats-on/tate-modern/exhibition/level-2-gallery-latifa-echakhch-speakers-corner/level-2-gallerywww.tate.org.uk/whats-on/tate-modern/exhibition/level-2-gallery-latifa-echakhch-speakers-corner/level-2-gallery. 5. See Harold Rosenberg, “The American Action Painters” (1952), in The Tradition of the New (New York: Da Capo, 1994), 23–39. 6. 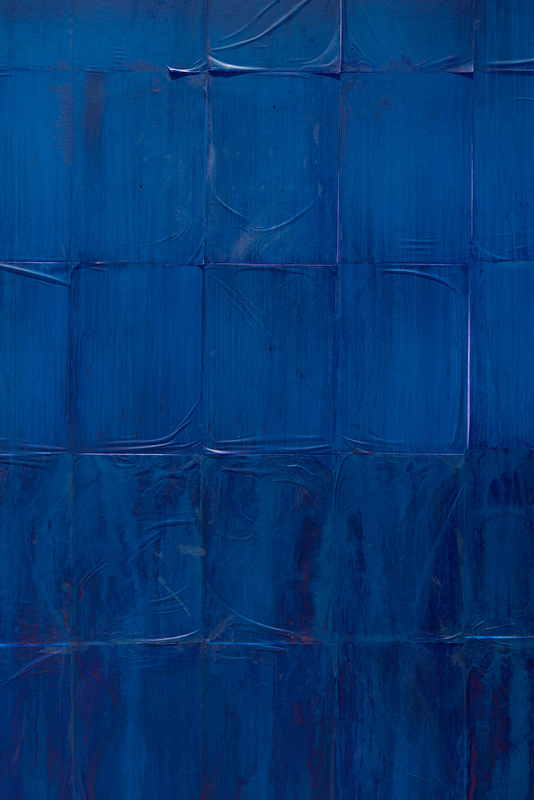 For more on the history of abstraction in Latin America, see Gabriel Pérez-Barreiro, ed., The Geometry of Hope, exh. cat. (Austin: Blanton Museum of Art, University of Texas, 2007). 7. See Milovan Farronato, “Nature Morte: Latifa Echakhch” (interview), Mousse Magazine, no. 19 (June 2009), http://www.moussemagazine.it/articolo.mm?id=101. Hammer Projects: Latifa Echakhch has received support from Stacy and John Rubeli. Generous support is provided by the Los Angeles County Board of Supervisors through the Los Angeles County Arts Commission and by Susan Bay Nimoy and Leonard Nimoy. 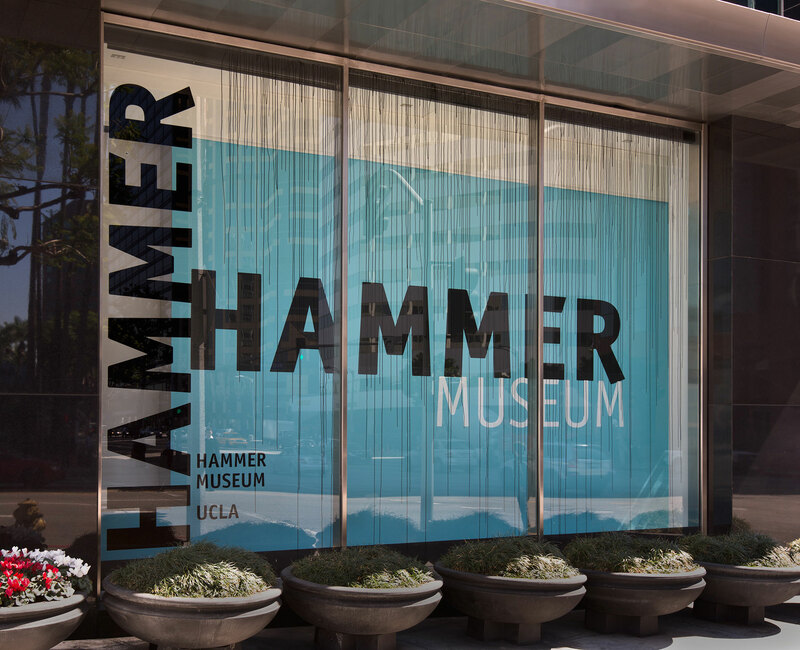 Additional support is provided by Good Works Foundation and Laura Donnelley; the City of Los Angeles Department of Cultural Affairs; the Decade Fund; and the David Teiger Curatorial Travel Fund.